The Arc de Triomphe du Carrousel is located between the Louvre and tuilleries gardens. It was built between 1806 and 1808 to commemorate Napoleon's military victories from the previous year. The big arc (Arc de Triomphe de L'Etoile) was designed the same year at twice the size, but not completed until 1836. 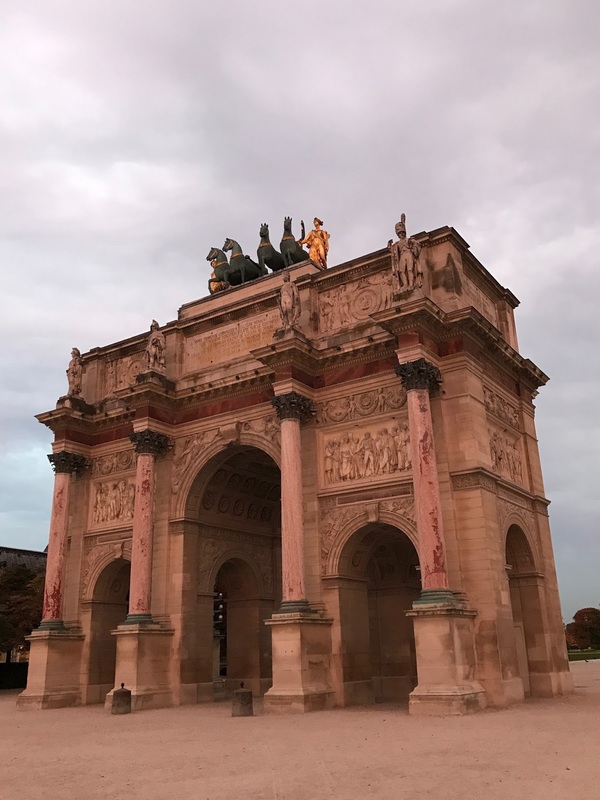 Looking west, a straight line passes perfectly through the big and little arches, aligned with the Obelisk in the Place de la Concord and threaded by the Champs Elysees. The colour of the Little Arc is not red or orange but a kind of white with maybe a golden tint. In the sunrise the arc, and the clay ground surroundings, have a beautiful hue.